The photos in this review are of the South Course - which is the most popular of the two designs. Water is a prominent feature on the South, with hazards in play in some shape or form on 11 holes. Fifty two soft sand bunkers, many of them deep and penal, are situated near the landing zones off the tee or greenside. 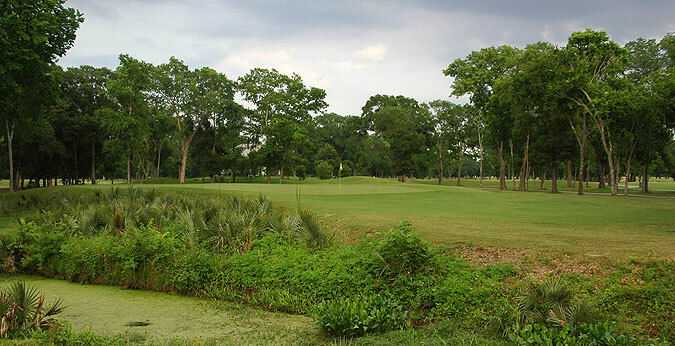 The front nine features a mix of tree lined and fairly open holes, while the back side is more tightly designed, with thick rows of trees and numerous water hazards in play. The 6 sets of tee boxes play to distances and slopes measuring 7191 yards/138 slope, 6957 yards/137 slope, 6434 yars/121 yards/131 slope, 6084 yards/121 slope, 5473 yards/129 slope for women and 4839 yards with a slope of 123 for ladies hitting from the forward tees. Holes 13 through 17 are a visual treat to the senses - as the 5 holes play over and around gorgeous natural wetlands, which are home to abundant native wildlife. There are some daunting carries - particularly on the par four 16th. Number 17 is a par three that uniquely features a beautiful wooden path way from tee to green, that winds right through the natural marsh. Though a bit intimidating off the tee - both these holes have sufficient landing zones and provide some room for error. They are challenging from the 3 back tees, bit much more friendly from the 3 front sets. This is true throughout the course. Jim Hardy is known as one of the best classical designers in the country, and he did an outstanding job of using the natural terrain in this layout. There is a mix of wide and tight fairways, straight away par fours & fives and doglegs, along with holes whose strategic features are dominated by water or sand. All in all however - what you see is what you get - no tricked up holes here. This is a beautiful course with outstanding conditioning from tee to green. Great service and wonderful facilities combine to make this a MUST PLAY in the Houston area. For more info, visit our page for this course, with direct link to their website by clicking here.